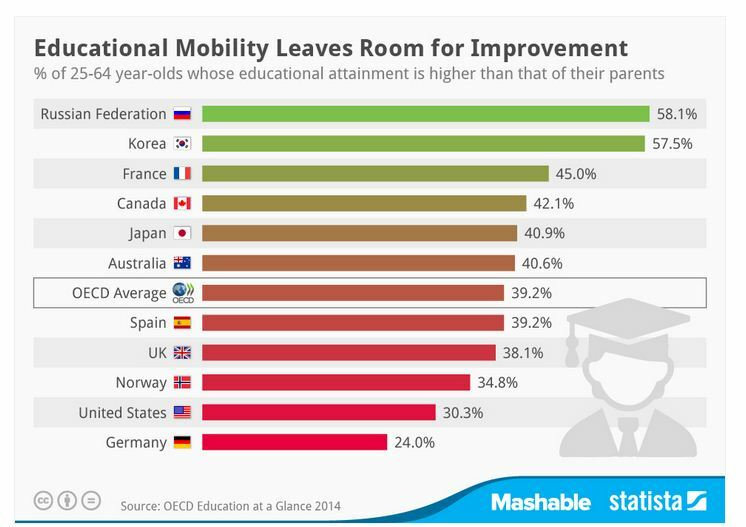 Educational Mobility Leaves Room for Improvement. – @Informal Blog for professionals Facility Management. Educational mobility (the degree to which a child’s education is influenced by the educational attainment of its parents) is key in avoiding the cementation of inequalities that exist in a society. According to a recent OECD report on the state of education, the current degree of educational mobility leaves room for improvement in many countries. In industrialized countries such as the United States and Germany less than a third of adults aged 25-64 years attained a higher level of education than their parents. These numbers indicate that there are still barriers to education that keep children from different family backgrounds from having the same access to education.